These Skinnytaste Quinoa-Stuffed Peppers are delicous served as a gluten-free main dish for Meatless Monday’s, or as a side for any dinner party! Recently, some newer friends invited us over for dinner. Do you know how much I just love that first visit to someone’s house? 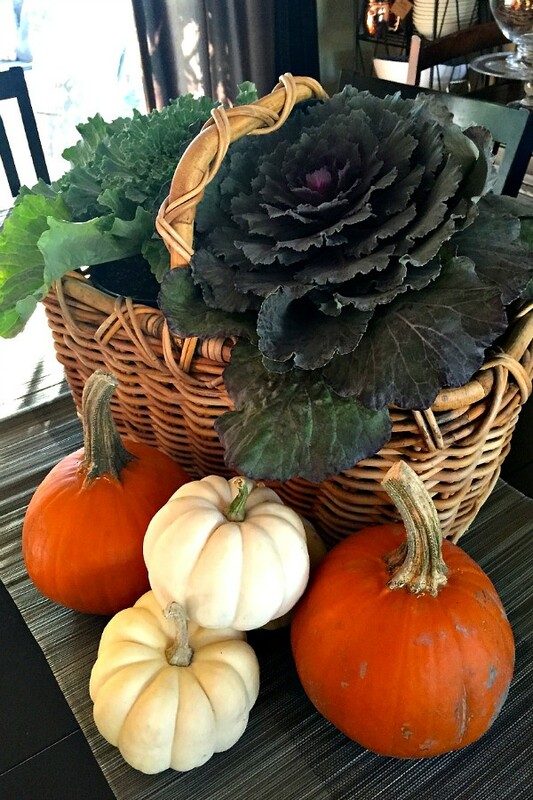 I love looking around, seeing the family pictures, their decorating style, books in the cases, kid stuff lying around, especially the kitchen–what dishes do they have?–and soaking in a bit of who this family is. Now don’t get me wrong, I’m not nosy, looking into things I shouldn’t, opening drawers, etc, LOL. It’s more of a feeling, a privilege and an honor to even be invited. It’s exciting, it makes me feel connected, more involved in “their world” (and less of mine), and it’s simply a very fun thing to experience. Some homes are more laid-back and inviting, some a little more uptight, some are very organized, some very much a go-with-the-flow type of attitude. I love it all, and of course I take a peek into the personality of each hostess. I really feel we hostess the way we do because of our unique personalities. And then, throw in a spouse or a partner, and BAM – it takes on a whole special flavor! I notice these things, because when people come to our house, I know they get to know us too, and the way our family ebbs and flows. The bottom line is that I want our home to be a reflection of our family. So back to looking around, feeling the fabric on the sofa, holding the stem of a wine glass in my hand, unfolding the paper or cloth napkin to lay on my lap–really, these things are minor. What really matters is the ambience and feel of the night. What really sinks into my heart is the treasure trove of stories told around the table. Whether at our house, or your house! When we gather, draw in our friends for food and drink and conversation, we have community. It’s about being honest, and being welcoming. 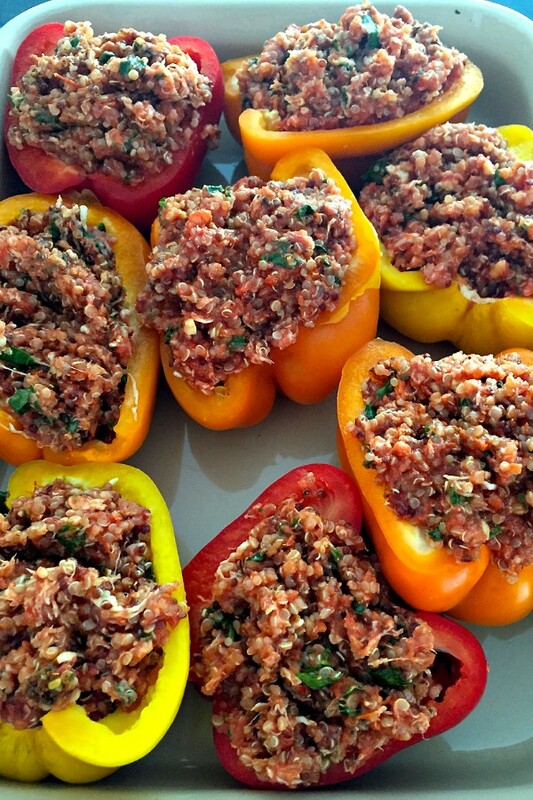 Now for the quinoa stuffed pepper recipe. Since it’s Monday, and many people eat “meatless” on Monday’s (thus, #meatless Monday), I recently brought these beautiful quinoa stuffed peppers to a dinner party. And they were a hit! 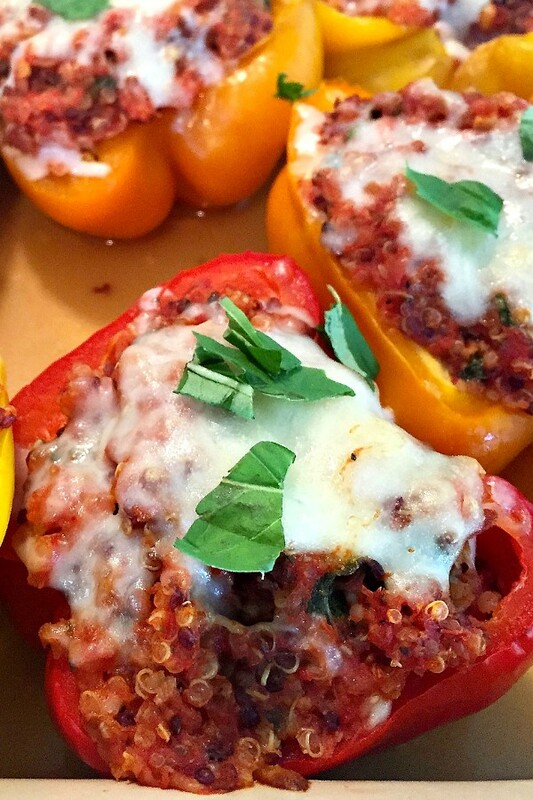 Are stuffed peppers a beautiful thing? I’d say this recipe is, but growing up, I wasn’t too crazy about the “bitter” stuffed green peppers my mama made. 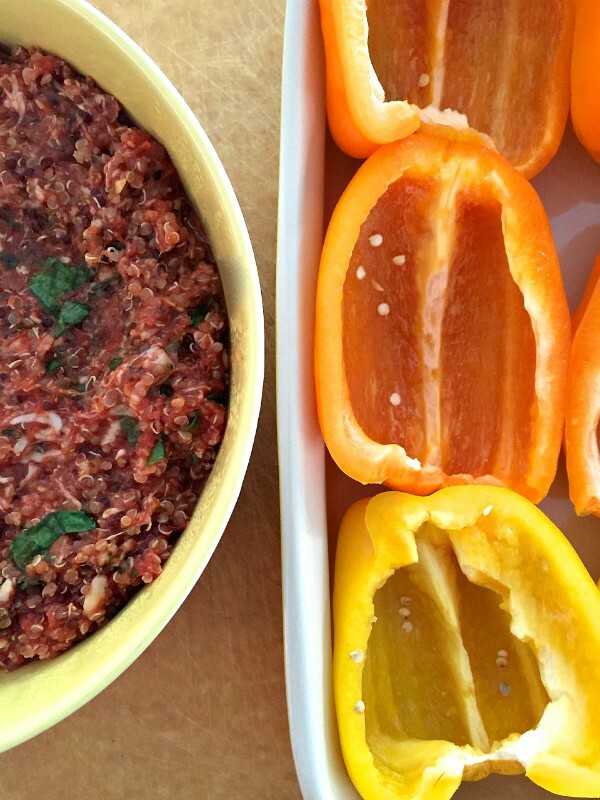 But now, with these gorgeous colored peppers (so sweet), and this quinoa mixture, they are delightful! 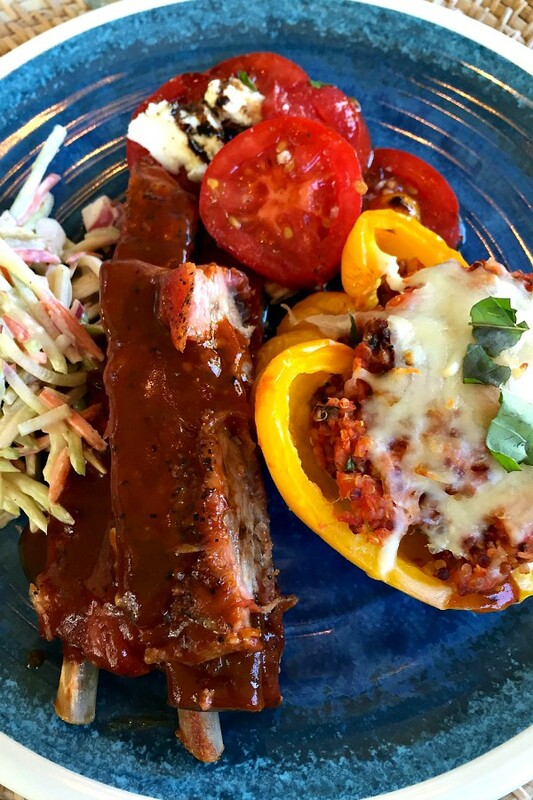 This recipe is from my friend Gina’s Skinnytaste Cookbook. 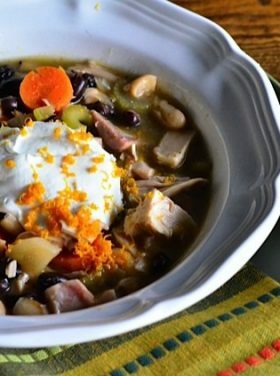 They are super flavorful, healthy, hearty, and a great dish to bring to a party when you don’t really know other dietary needs. These are gluten-free, and so easy to make! 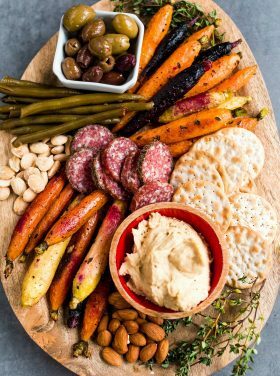 Bring these the next time you’re asked to bring a dish to a party! What do you enjoy most about visiting other homes? 1. Prepare the filling: Place rinsed quinoa in a medium saucepan. Add the broth and bring to a rolling boil. Reduce heat to low, cover, and cook until the liquid is absorbed, about 15 minutes. Remove the pan from heat and let stand, covered, for 5 minutes. Fluff with a fork. 2. Preheat the oven to 350 degrees F. Heat a medium saucepan over medium heat. Add the oil and garlic and cook, stirring, until golden, about 1 minute. Add the tomatoes, salt, and pepper to taste, and cook, stirring, for 5 minutes to develop the flavors. Remove the pan from heat, add the cooked quinoa, Romano, spinach, basil and mozzarella. 3. For the peppers: Halve the peppers lengthwise and remove the core and seeds. Place the peppers cut-side-up in a baking dish. 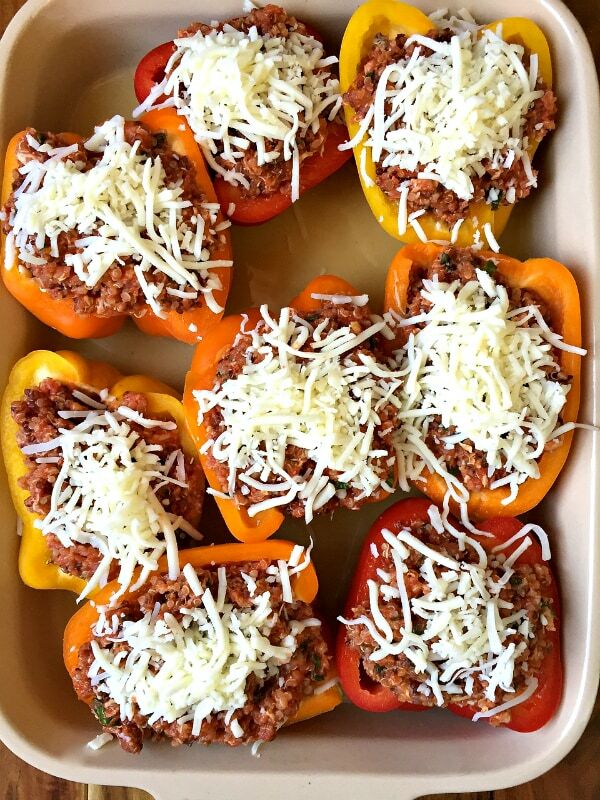 Fill each pepper with 1/2 cup of the filling. 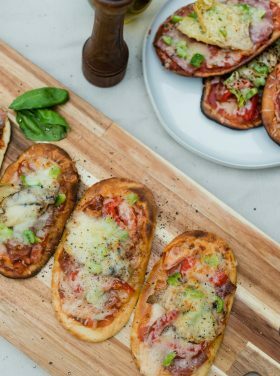 Top each with 1 tablespoon crushed tomatoes, 1/2 teaspoon Romano and 1 tablespoon mozzarella. Pour the broth into the bottom of the dish. Cover tightly with foil. 4. Bake until the peppers are soft, about 50 minutes. Remove them from the oven and let cool for 5 minutes before serving. What an awesome idea, I could eat those all day long! 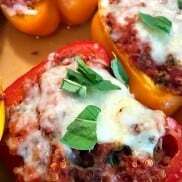 I am totally going to make these…I usually make stuffed peppers as a main dish (also using red, orange or yellow because I don’t like the bitterness of green), but I love this idea as a side. I too love going in to a home and noticing things and making sure I comment and compliment the hostess…even though they aren’t looking for it, I always pick out one or two things that I love. We take time to make our homes a reflection of us and it means so much when someone takes time to notice and comment.